Some years ago, when I was trying to get an agent for the first novel I wrote (which, thankfully, remains unpublished and buried in my desk drawer), I was working in the kitchen of a much-loved Jackson Hole, Wyoming restaurant called The Off Broadway Grille under the command of my old pal and culinary mentor Chef Al Belliveau. The restaurant was small, just twenty tables or so, with a cramped, open, two-man galley kitchen up to which I’d worked myself from the dishwashing pit in back. While I loved the frantic thrill of working the sauté station – in the captain’s seat, or “driving the bus” as we called it – my natural position was the salad and appetizer guy, the co-pilot, the Teller to Chef Al’s Penn. We’d work our asses off nightly – from the early tour-bus crowd to the last staggering table of scotch drinkers – every move critically observed by the waiting (and usually drunk) masses in the lobby. Our efforts were hot, stressful, tiring…and wonderful. I’ve never enjoyed a job so much, or felt so satisfied at the end of a day of labor. Every day during that summer of so many manuscript submissions, before prepping the salad station, I’d stroll down to the post office in my clogs and chef’s coat in search of any new agent responses. I’d hopefully pluck any waiting SASEs from my mailbox (knowing their age by the font I’d used for printing my address on them: Ariel went out on the first batch, Times New Roman on the second, and so on), not allowing myself to open them until I’d returned back to the restaurant where Chef Al would have an espresso ready at the salad station to brace me against the inevitable letters of rejection (really, they were ALL letters of rejection; was I too dumb to realize that if an agent had been interested in my manuscript he probably would have called?). I’d read them, one by one, before stacking them neatly and stuffing the pile behind some crouton crocks on a shelf at my station and getting to work. The wait staff, when they trickled in a couple hours later, could gauge my mood by the size of the envelope stack. They’d all read the novel, and even if they’d hated it (they never told me; maybe they were too kind, or maybe they just wanted to be sure they’d get their salads) those guys were pulling for me. Anyway, now it’s 2009; I’ve had my second book published and Off Broadway is gone, razed to make way for more lucrative tee-shirt shops and real estate offices in the valuable space it used to occupy (I only wish I was joking about that – I’m not). Many friendships from that time remain, though – Alan Belliveau among the best of them – along with some kitchen skills that have come in very handy in the years since. As the appetizer guy, I threw many, many snackie plates over the pass each night, and have appropriated most of those recipes to use myself. 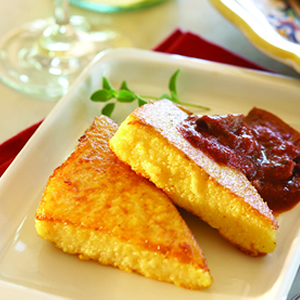 These polenta wedges have always been one of my favorites – they’re simple and fun to prepare, impressive-looking on the plate, and, best of all, delicious. While it involves a little bit of effort, preparing your own polenta is easy, and the results are well worth it. That pre-made stuff that you buy in a plastic sleeve like breakfast sausage is great if you like eating gummy, tasteless food, so leave it at the store. Expensive Italian polenta (not instant!) can be used, but I’ve used plain old cornmeal when it was the only thing I had around and it worked just fine. Steps 1 – 3 can be done up to a week in advance. I like to broil the wedges as close to serving time as possible so they’re warm and crisp, but you could probably get away with doing them a couple hours in advance. They’ll still be tasty. The wedges can be finished on a grill or under a broiler. You might want to jump ahead and prep your toppings before cooking the wedges; most of them are pretty quick to prepare, but it’s nice to have everything ready to go. To make roasted red peppers: Take a few fresh red bell peppers, do nothing to them (no stemming, no seeding, no cleaning, no nothing) and put them under a hot broiler, turning with tongs until the entire skin is blistered and charred. When they’re black all over, throw them into a mixing bowl, cover the bowl with plastic wrap, and forget about them while they cool. When you remember them again, take them out and rinse under cold water. The skins will slip off, and you can rip them open and rinse away the seeds. To make caramelized onions: Heat up some olive oil in a heavy skillet (cast iron works best) over medium-high flame. Take 4-5 biggish yellow or white onions, cut off the ends and peel, then cut in half along the axis. Lay the onion flat on its cut surface, then cut into rough 1/4 to 1/2 inch strips parallel to the axis. When they’re all cut up, dump them into the skillet and stir them around until they just begin to soften. Turn the burner down to low, add about 3 tablespoons of molasses (brown sugar works too), then stir frequently until everything reduces down to a dark mess of wonderful onion goodness. I’ll stir for almost an hour when I make them, going for a deep mahogany color. Not only great for the polenta wedges, but fantastic as a pizza topping or on sandwiches too. To make the polenta loaf: In the pot, bring the water and salt to a boil. While you wait, line the loaf pan with plastic wrap so that a few inches of wrap hang over the sides (you can overlap a couple pieces if you need to). Don’t worry if the plastic wrap doesn’t want to stay down in the pan; the weight of the polenta will hold it in there. When the water comes on boil, slowly add the polenta to the pot, stirring continuously with a wire whisk or wooden spoon to prevent lumps from forming. When the polenta and water are evenly mixed, turn the burner down to medium-low and stir for 25 minutes. You need to stir the polenta almost constantly or it will scorch on the bottom of the pan, leaving you with an unpalatable mess. During the stir phase, your arms will tire and you will want to quit early. Keep going! Switch hands if you need to. Have another drink. As it thickens, the mixture will bubble and spit hot polenta at your hands like molten lava; if this troubles you, wear your oven mitt while you stir. I don’t wear one, but you’ve been warned. After 25 minutes, the mixture will be very thick and will pull away from the sides of the pot. Remove polenta from heat and take a breath. Now pour the mixture into your loaf pan, using a rubber spatula (or whatever) to get it all in there. Again, don’t worry too much if the plastic wrap gets uneven in the pan. When you’ve transferred all of it, smooth out the mixture with your spatula and fold the plastic wrap over the top to cover (the plastic wrap makes the polenta very easy to remove from the pan, and protects it from off flavors while it cools). Now put it in the fridge to cool and solidify. If you’re doing this the day of your party, allow yourself a couple hours for cooling. In a pinch, I’ve rushed this part by chucking the loaf pan in the freezer, but a slow cool-down is best. As I said above, you can do this up to a week in advance and the polenta will hold nicely until you’re ready to use it. To make the wedges: Preheat your grill or oven broiler. If using a broiler, put the rack as high as it can go and keep the oven door open a crack so the thermostat doesn’t cycle the heating element and cool things down. While that’s going on, turn out your polenta loaf onto a cutting board and remove the plastic wrap. The loaf will be firm with a decidedly rubbery feel. This is normal! Now, with the top side of the loaf down, take a sharp knife and cut the polenta into 1/2 inch slices, just like you’d slice a loaf of bread. Don’t sweat it if you go a little too thick or thin; this is a rustic appetizer, right? Now lay each slice flat and cut diagonally so you end up with two pieces shaped like little pizza wedges. If you’re grilling the wedges, pile them onto a plate and drizzle olive oil over them; gently turn them and move them around so they’re all covered with oil (if you’re fussy about getting oil on your skin you can use a pastry brush for this part; I just use my hands). If you’re broiling, oil them up right on the sheet pan. The oil will give the wedges a nice flavor and keep them from sticking. – Spoon some salsa fresca on each wedge and top with a sliver of avocado. Garnish with a handful of coarsely chopped fresh cilantro. – Chevre cheese with fresh herbs. In a bowl, take two ounces of room-temperature chevre cheese (about a quarter of a store-bought log) and combine with heavy whipping cream about a tablespoon at a time until you have a thick, smooth mixture. Spoon a dollop of the cheese/cream mix onto each wedge, then sprinkle coarsely chopped basil and tarragon – about a quarter cup each – over the top. For bonus points, put your cheese mixture into a squirt bottle and go for a crisscross pattern over the whole shebang. If you’re not into goat cheese, use another soft cheese like mascarpone. – Roasted red peppers (see note) with freshly cracked black pepper and balsamic vinegar. Slice the peppers into long thin ribbons, lay one lengthwise on each wedge, then grind some pepper over the top. Give it a few dashes of good balsamic vinegar. – Caramelized onions (see note). Spoon some onions onto each wedge, finish with pepper and balsamic as with the red peppers. Or do a combo and alternate red pepper and onions on each wedge.